For my last day of Thanksgiving Break I decided to find some new trails to hike. I’d spent the prior day on housework, mulching leaves and doing laundry. The weather was warm for November, if blustery. I scanned the map for trails I had not visited, with the constraints of them not being more than a two-hour drive away and being free of any hunters. My eyes alighted on Sequoyah State Park at Fort Gibson Lake near Wagoner, home to one of the state’s remaining lodges, the oddly named Western Hills Guest Ranch. I’d briefly visited with some friends staying at the park some months back and they’d mentioned there were hiking trails. The state’s online map showed a variety of hiking and biking trails, although my own explorations would later show it to be out of date, which, when combined with very poor park signage, led me astray several times. Thankfully freezes had killed off the underbrush and made the consequent bushwhacking tolerable. I crossed the Highway 51 bridge over Fort Gibson Lake and arrived at the park around 10:15 a.m. I turned west off the main road down past the Paradise Cove Marina, noticing that one of the trailheads shown on the map was not marked. I drove to the adjoining picnic area to the south, where the map showed another trailhead for the small Eagle Roost loop trail. I parked in a sandy lot at the trailhead near some of the planted pines which line many of the park roads. Here there was a trailhead sign, although what I presume was once a registry box was a cobwebbed shambles. The trail had been mowed and looped about a small hill, with occasional green signposts providing direction at junctions. Other numbered signposts were presumably explained by some nature trail map I did not have. I find it most irritating that many state parks do not post all of their trail maps and guides online, forcing one to either inquire at a park office or do without. And Oklahoma’s travelok.com website was redesigned a year or so ago, for the worse, and now provides only sketchy information on most of the parks. The only notable aspect of the trail was the Cockrum Cemetery, a burial plot of about a dozen graves which had a picket fence and reconstructed tomb which were put up a decade ago. The cemetery began with the burial of Ka-tee Cockrum in 1884 in a tomb of native stone. By the 1920s the area was so neglected that the stones were reused for a grain silo and the headstone moved to the family homestead. It returned to this site in 2000 when the cemetery was restored. The sign explaining this mentioned a North Ray cemetery – later I would realize that the peninsula the park occupies was once home to a ghost town called Ray. A church, the Ray Mission, is nearby with another, larger cemetery. After lunch I drove over to the nature center and found a modern trail sign for the Three Forks Nature Trail, indicating part of it headed off north along a paved pathway. I shouldn’t have trusted the sign – the paved path was a mountain bike trail and, as far I could tell with later exploration, there is no Three Forks Nature Trail segment heading north from the Nature Center anymore. A north loop for the trail is shown on the park maps, but the area is overgrown and only a few sections of the former trail, discernible by field stone curbing, remain and are cut through by barbed wire fencing. I don’t like hiking on asphalt trails in my boots, but I persevered and headed north for over a mile, passing the riding stables, until the paved trail petered out at the road to the closed Cherokee area. I could see it had been planned to extend the trail north from there, but that work had not been completed. My map indicated another section of bike trail to the west, and I found it was there and was happily unpaved but cleared. So I followed it and noticed that it branched off to the north to join with the Eagle Roost Trail – I’d seen red tree blazes for that section of bike trail earlier, although it was not shown on the online maps. My section of bike trail turned south and then, frustratingly, ended at the road to the Seminole area. The silly map acted like it just crossed the road, but that wasn’t true. I turned east along the access road, arriving at the Ray Mission church and graveyard, close to the main road. No trail signs, but I did see a cleared path to the south. I followed it and it lead to a sewer lagoon, again with no signage. I took another southern trail, which popped out on the Creek area access road, with no further trail to the south in evidence. Maybe I was on the wrong path entirely or hadn’t stuck to the perimeter of the sewer lagoon for long enough. Oh bother. I wandered through a mowed field looking for a path south, but no dice. So I returned to the access road and guessed the promised trail might lie to the west. After passing another large mowed field, I found the bike trail again and followed it south to a creek close to the lake shore before it turned southeast to finally pass another sewer lagoon and terminate at the Chickasaw area access road by the golf course. I walked back east along the road and found a large sign for the bike trails which showed the supposed path of several different sections. It was only approximate for the bike trails and, like the online map, showed a north loop for the Three Forks Nature Trail which I would later find had been abandoned. One hopes they have more accurate maps available at the park office or nature center, but given the shoddy park signage, I wouldn’t count on it. Returning to the nature center area, I scouted around and confirmed that the west part of the north trail loop was non-existent. So I walked south along the road to where I’d earlier spotted a sign for the Fossil Nature Trail, or Fossil Trails, as the sign put it. This trail (or trails?) did exist, and was the most scenic in the park. It made its way along the rugged and rocky eastern shoreline of the peninsula, allowing me a chance to scramble down to the water and along the rocky bluff. When the shoreline bluff became impassable I backtracked and found an unmarked and crumbling cemented stone pathway back up to the main southbound trail. This last bit of southbound trail had some abandoned and crumbling picnic tables, reminding me of the neglected cove I’d seen at the start of the day. 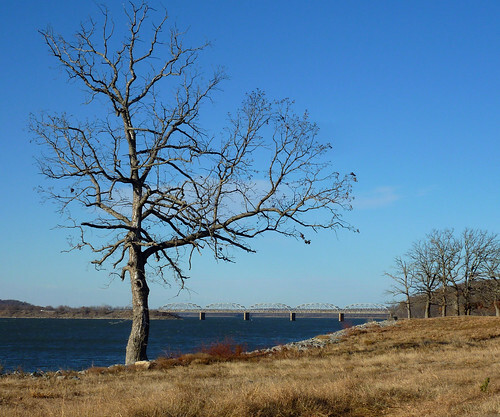 A big driftwood tree was interesting and the trail ended at a dock to the east of the lodge, where I could see Fort Gibson dam in the distance. I retraced my path northward, following an abandoned unpaved roadbed for part of the way. Soon I was heading north on the remaining part of the Three Forks Nature Trail, which then reached an unmarked fork. The path to the left appeared to head back toward the nature center, while that to the right headed downhill toward the lake and was presumably part of the north loop toward the Choctaw area. I took the right fork. The trail could only be discerned by native curb stones lining its sides, which stuck up through the plentiful leaves. A short side trail led down to abandoned equipment where what I take to be the park’s water pipes run down into the lake. Eventually the trail popped out at the Choctaw RV area. A dilapidated sign pointed westward, but I couldn’t easily spot a trail and wasn’t in the mood to ask the camp host, the only trailer in the area, for directions. So I bushwhacked my way westward along a barbed wire fence and eventually came across a north-south section of what was once the Three Forks Nature Trail’s north loop. The trail petered out to the north, and to the south it ran into new barbed wire fencing, forcing me to bushwhack westward to a road and return to the nature center.